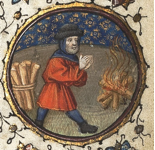 In medieval England the Twelve Days of Christmas constituted a long holiday, during which ordinary work was suspended as much as possible, whilst conditions made spending long periods outdoors rather unattractive. Tradition also led to large gatherings of relatives and neighbours on numerous occasions during this time. Obviously this could have its complications, and it may be worth noting that there were special traditions as to how to pass all this time. Feasting was, of course, central – and it is likely that sleeping this off was also featured. What is perhaps surprising is the amount of time people spent wearing masks and different types of disguise. But this does actually make sense since, when ordinary life resumed after Epiphany, all bad behaviour could be left behind, along with the masks and the costumes. For those who wish to try this method in future, or to compare their own party season with its medieval predecessor, here are day-by-day notes, based on a range of medieval household accounts, sermons, poems and penitentials. Christmas Day is the day for unrestricted feasting, and for visiting (and receiving) neighbours from early morning into the evening. You should also display your most spectacular decorations, and arrange a musical performance of some kind. One English royal banquet is recorded as having involved 10,000 guests, who consumed 200 oxen and 200 barrels of wine, but this may be a little ambitious…. 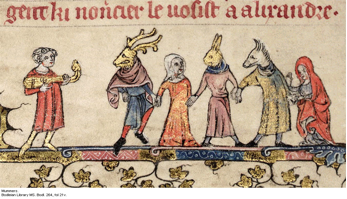 This image, from a manuscript in the Bodleian Library, is traditionally said to show a group of mummers. Day 3 could be the day to try Hoggling. This will also mean that you do your bit for good causes, since you will be collecting money and donations in order to provide lamps and candles for those who need them. The amount collected will depend upon your skills at telling jokes and stories. Day 4 is Holy Innocents Day – which is an unlucky day. However, this can be countered by trying the old English tradition of wassailing. You need a large, heatproof cup or bowl, filled with mulled wine (or cider). The first person takes this and says ‘Wassail’ to their chosen friend, who replies ‘Drinkhail’. The first person duly drinks – then gives the second a kiss and the cup. This continues until everyone has had a turn; or until the drink runs out. If energy starts to flag, spiced bread, cake, candied fruits, gingerbread or liquorice can be eaten. Day 5 is the day to organise competitions and to award prizes (value is flexible). During daylight, sporting competitions are popular (the medieval version of football should perhaps be avoided!) For something quieter, and to enliven the evening’s feasting, competitive performance of poetry is a traditional alternative. Day 6 is the day to rest from your labours a little and to call upon the services of professional entertainers (the rich will have hired a group of performers for the whole season). Jesters and minstrels would, of course, be the popular choice; but you could ask for volunteers from amongst your friends and relatives…. Day 7 On New Year’s Eve you might wish to try to ensure good luck and prosperity for the coming year by making a symbolic start at all the important things you have to do before next Christmas. This could be combined with miming, to see whether your friends and relatives know just what it is that you do. This day also has magical properties. If you wish to find out how you will prosper in the coming year, you will need a supply of dried beans (and a fire). You put a mark on your chosen bean, to identify it as yours and to link it with your chosen question; then you put it at the edge of the fire. If your bean jumps, that is a good sign – but not if it jumps into the fire. Women can also try their hand at literal spell-weaving. You will need brightly coloured ribbons and threads, with small pieces of fabric chosen to represent important people or things. These are woven together today, and there you have your spell. Day 9 continues the link between New Year and the supernatural. The court of King Arthur supposedly expected members to tell stories involving personal triumphs and encounters with ghosts. Alternatively, you could stage the story of Sir Gawain and the Green Knight, which began at New Year. A green giant rode into King Arthur’s great hall and challenged the knights of the court to take a swing at him with an axe – as long as he could do the same to them a year and a day later. Sir Gawain took up the challenge and cut off the giant’s head with a single blow; but the giant picked up his head and rode away, leaving Gawain to follow if he dared (which, of course, he did). For those who do not wish to go that far, a simple telling of ghost stories will suffice – and the works of M R James are highly recommended. Day 10 can be brightened by making gifts to be given at Twelfth Night. Those who enjoy baking can try their hand at the traditional cakes (with bean and pea if desired). If you need a break from party food and drink you can knit warm scarves and hats, or pot bulbs for the spring, since the gifts should be useful rather than valuable. Day 12: the Grand Finale recaps all the festive themes of dressing-up, gift-giving, feasting, dancing and game-playing – all at once! In the early part of the day you can try making and hanging a Star of Bethlehem. You can then wrap your useful, hand-made gifts, and dress up ready to go in procession around the neighbourhood. The theme today is the three magi; but costume choice is optional. In the evening you feast again, and the grand finale to your celebrations is to hold a pageant, in which everyone must perform. Popular themes are St George and the Dragon, or mock combats. Another possibility is to build a miniature castle out of marzipan, biscuits and sugar – and then to knock it down by firing walnuts (in the shell) or small oranges at it. The remnants are then eaten (obviously). If you are feeling even braver, you can elect a Lord or Lady of Misrule – but you then have to do whatever they tell you, until the end of the holiday….